If horticultural is a new word for you, it should be obvious to you that the profession is about gardening. But, what does a horticultural therapist exactly do? Well, if you choose to become a horticultural therapist, you will be using gardening as a means of improving the health and well being of your client. Now, clients you work with will vary from physically disabled people, mentally ill individuals, elderly people, people with learning difficulties, offenders, ex-offenders and those who are trying to recover from drug abuse or major illness conditions. The work responsibilities of a horticultural therapist may vary depending on the type of client they attend to. Typical job responsibilities of these professionals are as follows. 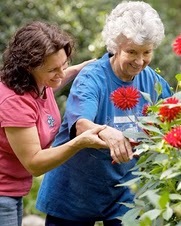 Horticultural therapists work in close contact with psychologists and social workers. In addition to handling the above mentioned duties, you will also need to manage staff and volunteers. You would need to prepare proposals for projects and use ways to raise fund. If you have some prior experience and qualifications in related human services fields like social work or occupational therapy, you can take additional courses in horticultural therapy to start working in this field. There are several community colleges, professional colleges and universities that offer short term courses in horticultural therapy. Volunteering on therapeutic horticultural projects also provides candidates with real world experience. Candidates can choose a degree program according to their individual preferences. You can choose to take the courses either via campus mode or distance mode. For some of the above mentioned courses, you would not need any prior qualification. Some volunteering experience in a relevant field makes you eligible to enroll into many of these horticultural therapy degree programs. Horticultural therapists have no dearth of job opportunities. You can easily land jobs at places like rehabilitation units, hospitals, prisons, charitable and voluntary organizations, schools and specialist colleges among others. So, if you have an avid interest in horticulture and possess an encouraging and motivational approach to serve a wide range of clients, becoming a horticultural therapist is just the right career for you. Enroll in horticultural therapy courses and be ready to establish a career in the field of human services.